eCommerce Shopping Cart Software eCommerce Shopping cart software for digital delivery, subscription and shipped products. Your online store is just a mouse click away. Of course, we couldn't talk about our services without mentioning our ecommerce shopping cart software! Modular Merchant online stores are flexible and provides the same tools that big companies use, but at a fraction of the cost. "Modular Merchant's shopping cart makes eCommerce deadly efficient." — Brad C.
Developing the best shopping cart software for digital and shipped products. How will I succeed with Modular Merchant's shopping cart software? Modular Merchant's goal is to enable you to sell shipped goods, sell downloads, memberships and sell products with automated recurring billing. We want to simplify adding your shopping cart to your website, integrating it into your Facebook page and adding "Buy Now" links to your Twitter feeds. Your customers will find you, wherever they are. We want you to make sales whether your customers are shopping from their computer, smartphone or tablet. The Modular Merchant shopping cart software includes built-in, customizable templates to automatically display store content optimized for mobile devices. In short, we want your online store to be ubiquitous. The better our clients do, the better we do too! Help your customers find you on whichever device they use, and optimize your store for each one. Search Engines will like you. What good is having a deadly efficient™ shopping cart software if your customers can't find you? That's where the shopping cart software's suite of built-in SEO (Search Engine Optimization) tools kick in. For example, your entire store can be hosted under your domain name, which is just one simple way to improve SEO. But we don't stop there. A Google Sitemap — which helps Google find and index all your shopping pages — is generated for your store, and updated every day. URLs in this format are easier for search engines to record and categorize the pages for each product in your store. And if it's easier for search engines to understand what your website is about, then it's going to be easier for the customers using them to find your store. Finally, the internet accepts me as one of their own! You're joining forces with an industry leader. Modular Merchant has been developing our shopping cart software since 2001. For over a decade, we've watched as other carts have come and gone. All the while, we've remained dedicated to producing quality software and providing stellar customer service. We're very fortunate in that we love what we do; we relish continually learning new web technologies on the cutting edge, and incorporating them into our shopping cart software. Our vocation is also our passion, and it shows in the quality of the software. Put our knowledge of ecommerce, online security and PCI standards to work for you. Take advantage of our years of experience and free technical support. We're always happy to lend a hand. Support is part of what we do, and we'd love the opportunity to support you. Cool as we are, we'll never be as awesome as the software developers who live in stock photos. With Modular Merchant's shopping cart, there's nothing to install — the entire ecommerce suite is web-based. To manage your online store, all you need is a web browser and an internet connection (and possibly a fruity drink with an umbrella in it, if you're working from the beach today). Modular Merchant can do a lot for your store: products, promotions, coupons, gift certificates, special events, wholesale vs. retail pricing, sales, customer accounts... and much, much more. At the same time, we work tirelessly to make the cart as user-friendly as possible. We're continually making updates to improve the usability while adding new features and functionality. If you run into speed bumps, our tutorials and tech support are ready and waiting to help you. • Want assistance configuring your store? Not a problem. • Need help setting up a special promotion? No sweat. 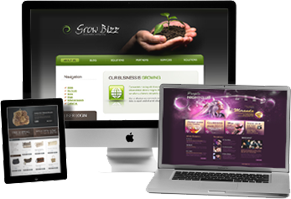 • Looking for a designer to update your website? We can help. Modular Merchant's support team is available by phone, email, and there's even a Support Ticket system built right into the store software. Let us know what we can do for you today. Whether you're selling shipped goods, downloads or services, there's no reason not to have Modular Merchant pushing your cart. Once you're ready to get started, just complete the sign up form. Since the shopping cart is web-based, there's nothing to install on your computer and your account will be installed and ready to log into within minutes. That's all it takes to start. Once your account is created, you'll be able to log in and start personalizing your store's settings and adding products. Either take advantage of the free thirty day trial to experiment, or activate your Modular Merchant account now to start selling products immediately. Start your account today, and you you'll be up and running today!